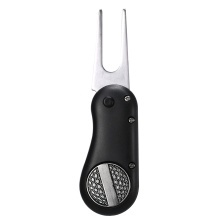 Foldable divot tool to avoid scratching your pocket or finger. Pop down button for easy folding and unfolding. Magnet ball marker can be attached to the divot tool. Plastic shell for solid grip and feel.